I walked into a Lexus dealer when I was in Japan. This one was located not far from the Yokohama Chinatown. As I mentioned back in May, I’m in car analysis mode, and thought it was interesting to look at a Lexus in the country of its origin. The Lexus dealer in Austin is fancy and probably the nicest dealership in Austin. But this one in Japan was even fancier and looked and felt like a museum. 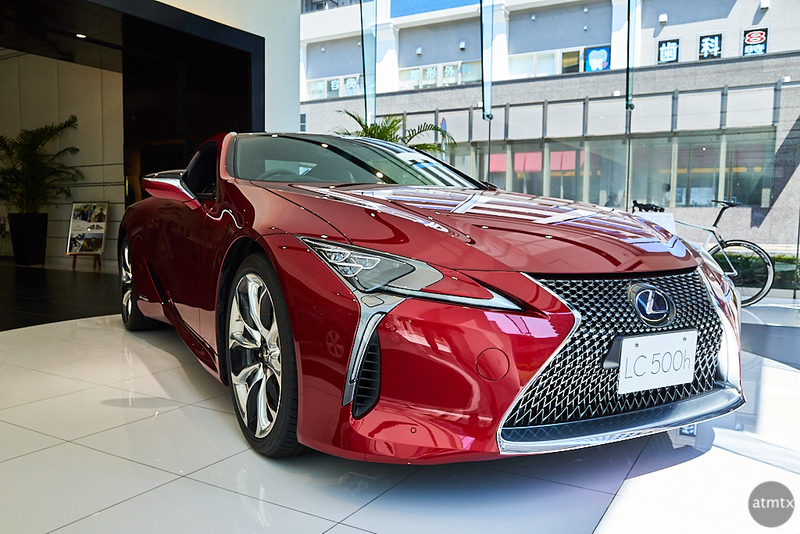 The LC 500h is one of the newest. A hybrid GT (Grand Turismo) also available in U.S. for about $100,000. Unlike the regular Japanese cars in Japan, which are usually equal to or less expensive than in the U.S., Lexus is more expensive in Japan. You might be surprised to learn that Lexus, Toyota’s luxury division, started first in the United States in 1989. They did so with the purposely built LS 400. It wasn’t until 2005 that Lexus dealerships were created in Japan, though the cars badged as Lexus were sold in Japan under the Toyota name. No, this is not a car I have under serious consideration. But, it makes for a nice photo on the blog. Very! Perhaps the more expensive the shinier it gets.